The story behind this cottage in Herstmonceux is that the property was owned by two elderly ladies who were possibly Methodists but certainly were anti alcohol. When the property over the road to them opened as the Brewers Arms they were not amused and planted an cotoneaster which was clipped into shape to read Praise the Lord and to make all aware of their dislike of a drinking establishment so close to their home. Like many stories that get passed down I am not sure which parts are correct and which parts have been ebellished; the Brewers Arms has been around since the 15th century (or so it claims) so either the Methodist ladies were very very old or it was already a pub when they moved into the property. 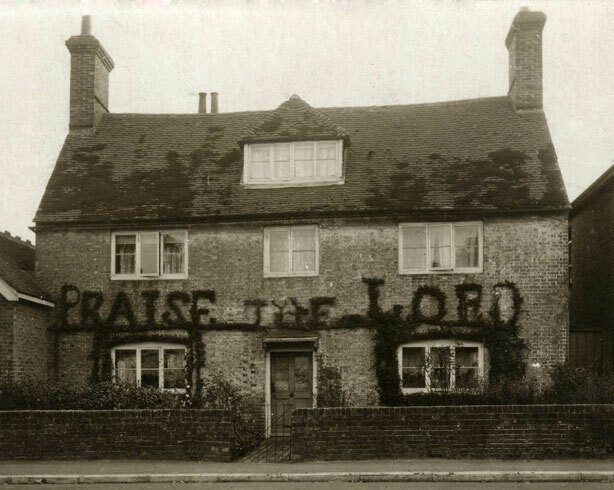 Regardless of this it became well known throughout Sussex and coach tours would deviate to show the it to the tourists and the cottage became known as Praise the Lord Cottage. It was like that for many years but eventually the house sold in 1957 and the new owners found that the plant had died and had it removed. The granddaughter of the previous owners apparently was so unhappy about this that she placed a curse on the new owners!! The curse seems to have had little effect on the new owners who lived their until the 1980s and renamed the property as Cotoneaster Cottage. In village quaint of Gardner Street,Stands a dwelling, clean and neat. The property is still there although it looks very different now, in the last few decades it has been a bakery, a tearoom, an estate agents, a home interiors shop and is currently a hairdressers. What a great story and picture to bring it to life. I've read about the two elderly sisters before (someone thought they were Russian, I believe) but I don't know their identities. However, the cotoneaster and the topiary words are attributed to my Great Grandfather Levi Baker, b1827 Warbleton, d1882 Herstmonceux, who was a farmer and carrier. He married twice and a son by his first marriage, Levi George (sometimes George Levi) is also said by some to be responsible for the topiary. I haven't got to the bottom of it, so who is correct? I had not heard the story of the curse until I started my research and discovered living descendants of the first family. I am a descendant of the second. Thanks for getting in touch. If you find out anything more about this story I'd love to hear it. Whoever was responsible for it I have always thought it a great way to get your opinion aired! My great grandfather was Levi Baker. Levi married twice and I am descended from Thomas Baker. The brother of Thomas went to America and his descendant got in touch with our family. I would like to know your relationship to me please. I note that Mark Holmes is also a relation.I am not a blogger and did not like to leave my email address on for safety reasons. I know of two relations who emigrated to Canada: Thomas Lester, b.1877 (a child from the second marriage) and Evelyn Levi, b. c1885 (a grandchild from the first marriage). Is your connection through Thomas Arthur and Levi George? If so, your great grandfather would be Levi George and his father, Levi, would be your 2x great grandfather. I feel compelled to note that there are few mistakes in the story in the main blog. I acknowledge that it is noted as being changed slightly as it had been past down and I'd like to contribute. In a similar way to Mag in the previous post, I'm also a relative of Levi Baker, me being his three times great grandson. It was in fact he who lived in the house and grew the plant to say 'praise the lord' and it was because of the brewery. However the statement that the plant had died and been removed in 1957 is incorrect. My mother remembered seeing the plant itself around the age of 12/13 which would have been in 1983 after which had died and been removed. Granted the plant no longer fully read the message when my mother saw it but the plant itself was still there. My grandfather was contacted by a person from America who claimed also to be a descendant of Levi Baker but as of yet we have no evidence to support this. The same grandfather has done years of research including travelling to America for the sole purpose of family research. We now have a large family tree printed on a piece of paper larger than a square metre dating back centuries before Levi Baker, bearing in mind that a majority of the tree is based on the Lade side of the family rather than Baker. My father in law purchased Praise the Lord house in 1957 and removed the plant the following year as it was dying and renamed the house Cotoneaster. My husband and I lived there until 1983. It would be good to know how Anonymous (the first) and Markholmes95 are connected to Levi Baker! I am connected through the second marriage and have been researching my family history for a long time. Anonymous (the second) is possibly referring to Mr Crouch? You say you can go back a fair way from Levi. Are you descended from Levi's first wife, or second. I am descended from the second. Levi BAKER (b1827) and Harriett nee FULBROOK (b1843) are my great grandparents. Their son, Nelson (b1875), is my grandfather. Two of Levi's children married LADEs; are you by any chance related to Albert Ernest and Colin Baker? Albert was the second child to marry a LADE. There are indeed relatives in America and Canada and I am in touch with two of them! I look forward to learning more about your connections.